The Life Fitness Club Series Elliptical Trainer is ON SALE! The Life Fitness Club Series Elliptical may seem familiar to you. It is present in health clubs across our country and enjoyed by thousands of users! Now you can have this same great quality, power and durability in your own home. The Club Series from Life Fitness features an extremely durable design and rear-drive system. Choose from three levels of warranties for your premium machine. You should know that Life Fitness focuses entirely on strong ergonomic design and quality construction. This means their machines are designed to mimic the motion of your body and reduce joint stress. It also means that their machines are not filled with fancy interactive tech features. If you are a person that just cares about getting down to business – then Life Fitness is a good fit for you! Life Fitness Club Series Elliptical Sale! The Life Fitness Club Series Elliptical typically sells for $4,299. The Club Series Elliptical from Life Fitness is a classic and popular machine. It comes with a cup holder, standard moving arms, a 20″ stride length, over-sized non-slip pedals and 10″ step-up height. The Club Series can handle users up to 350 lbs and includes Whisper Stride technology. This is a powerhorse machine. It will last you for a LONG time. The 235 lb machine weight will provide a solid base for users up to 350 lbs. Heart rate sensors are located on the moving arms so you don’t need to adjust your grip to check your heart rate. This machine also includes a wireless chest strap if you prefer. Choose the level of warranty you’d like to pay for. Your options are a Standard Warranty, 3-Year Extended, or 5-Year Extended. We like the classic design and sturdiness of this machine. It is designed to mimic the motion of your body and reduce stress on your body’s joints. The elliptical path feels very natural and fluid. This machine can work both your upper and body evenly. There is a stationary bar to hang on to if you are planning to focus on your legs and glutes. WhisperStride Technology – This is a super silent machine. The ball bearings are specially designed to reduce friction and provide smooth motion. 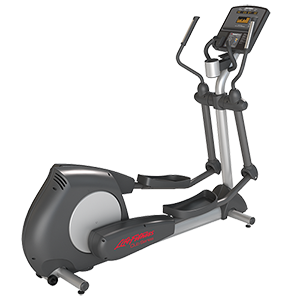 The Club Series Elliptical does not come with any entertainment or connectivity options. You will need to use a regular old TV if you want to watch your favorite shows while you workout. This machine is really all about getting down to business. If you are less focused on fancy interactive features…and more focused on just sweating…then this machine is perfect for you! Also see the Life Fitness E5 Elliptical Review.